It was a muggy day in late August 1985, when a creepy guy wearing a black Jack Daniels T-shirt and dirty jeans sidled up to the History Department desk, asking for books on torture and the occult. In the era before computers, working at L.A.’s Central Library reference desk was much more of a face-to-face job, and many of the patrons I served were troubled: Ex-cons, drug addicts, skip tracers, the mentally ill, and plenty homeless folk came in from the street to get a few minutes of peace in the old library. So let’s just say it wasn’t unusual to field an inquiry such as this, but this spooky little man had been skulking around the department for a few weeks and rarely approached the desk before. His teeth were stained and rotting, he reeked of sour sweat, and his eyes were glassy and lifeless, like those of a mean dog. He had a scary predator vibe that made me uncomfortable just to be in his presence. My first reaction was to avoid making eye contact, but he was right in front of me. I looked over at my boss, Frank, for help and he said “Social Science” without hesitation. Before the library fire of 1986, Social Science was our sister department in a room that is now part of the Children’s Department. It took the sketchy character a few seconds, but he finally turned and headed away from the desk. I shrugged off our unsettling exchange as another midweek desk shift in down-on-its-luck L.A.
On Saturdays a few of us librarians would meet up at the library and head over to the Yorkshire Grill for a cup of coffee and cholesterol, picking up a copy of the Herald Examiner on our way into the restaurant. Days after our experience with “torture and the occult,” I did just that and shared a shocking sight with Frank as we slid into a booth. On the front page of the paper that morning—August 31, 1985—was a picture of our patron looking very much like he had when he visited the reference desk the previous Wednesday. 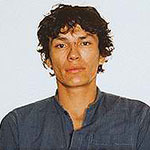 A headline blared over his image: “STALKER SUSPECT NAMED.” Our visitor had a name and it was Richard Ramirez—the one and same who had been terrorizing Los Angeles for months. Ramirez, it later became known, had been indelibly twisted by experiences with his cousin, Mike, who showed him photos of grotesque torture he had gathered while serving in Vietnam, and shot and killed his wife with Ramirez in the room. Some have theorized that trauma likely desensitized Ramirez to acts of cruelty and violence. Ramirez reportedly asked many of his victims to swear allegiance to Satan, which might explain his obsession with the occult. As a result, he garnered a following himself of those who claimed Satanism as their religion during the four years of his trials. The details of his crimes make me wonder if what Ramirez learned in the stacks of the library got put to use in the terrible acts he committed. 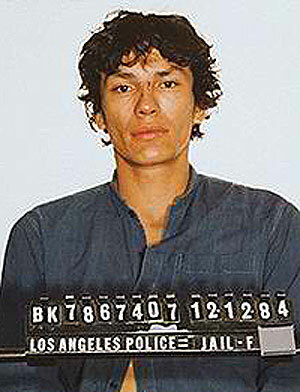 Once he was identified on the front pages of Los Angeles newspapers, Ramirez lasted just one more day on the street. His mistake was venturing into East L.A. and assaulting a woman while trying to steal her car. After being surrounded by locals, he got a neighborhood beating that he barely survived. Before then, Ramirez had been living in the Cecil Hotel at 6th and Main, just a few blocks from the library, living on candy bars and drugs. Ramirez was convicted of 14 burglaries, 11 sexual assaults, 13 murders, and 5 attempted murders. It still gives me the chills to think about the dead eyes that his victims must have looked upon in terror. I’ve looked into those eyes, and am still haunted.